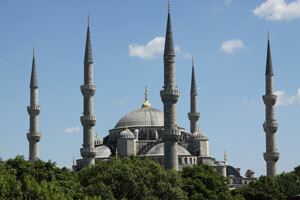 Acclaimed filmmaker Sir Ridley Scott has teamed up with Turkish Airlines to direct a cinematic short film set in Istanbul, where East meets West. “THE JOURNEY,” a story of a chase across the city’s iconic landmarks, pays homage to the ancient city of Istanbul, the airline’s hub for 85 years, spanning the continents of Europe and Asia. A 30-second commercial was shown during Super Bowl LIII, one of the most watched sporting events on the global calendar, while the six-minute cinematic short film version was launched simultaneously via Turkish Airlines’ YouTube channel. As the first Turkish brand to advertise at the Super Bowl, Turkish Airlines has been delighting audiences with its inspiring and original commercials. In 2016, the airline debuted the “Batman vs. Superman” campaign,” the next year, Morgan Freeman invited the global audience to “Widen Your World” and in 2018, the “Five Senses” campaign by Dr. Oz explored the wonders of the world through five senses by visiting some of the most unique places around the globe that Turkish Airlines flies to. Scott was directing his first commercial in 15 years to mark the opening of Istanbul Airport, the new home of Turkish Airlines. “THE JOURNEY” showcases Istanbul as the hub of Turkish Airlines and the new centre of aviation for global travellers, which will be the world’s largest aviation hub with an annual capacity of 200 million passengers. Turkish Airlines flies to more countries than any other airline, currently connecting to 306 destinations in 124 countries, which will expand as it moves its hub from the current Istanbul Ataturk Airport to the newly opened Istanbul Airport. Sylvia Hoeks, known for Blade Runner 2049, plays the leading role alongside key Istanbul sights such as Çırağan Palace, Basilica Cistern, Ortaköy Square and Istanbul Airport. The airport hosted the shooting, with a cast of 250 people, while the film in total starred 500 actors. The scenes at the airport portray Turkish Airlines’ cabin crews wearing their new uniforms as well as innovations in inflight cabin design. The British director is known for such film classics such as Alien (1979), Blade Runner (1982), Thelma and Louise (1991) and Gladiator (2000), as well as the recent hit The Martian (2015). The JOURNEY can be viewed at https://www.youtube.com/watch?v=C5CbPzfzhnw.